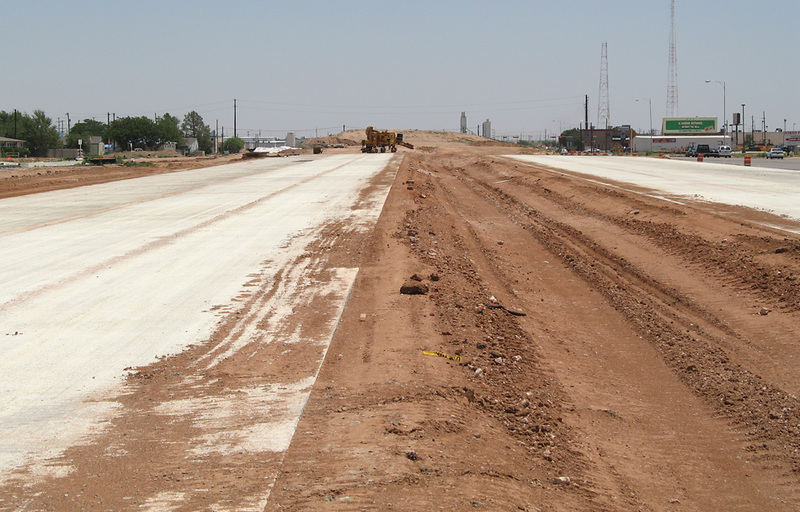 This project is building an all-new freeway on the alignment of US 82/62 in west and southwest Lubbock. 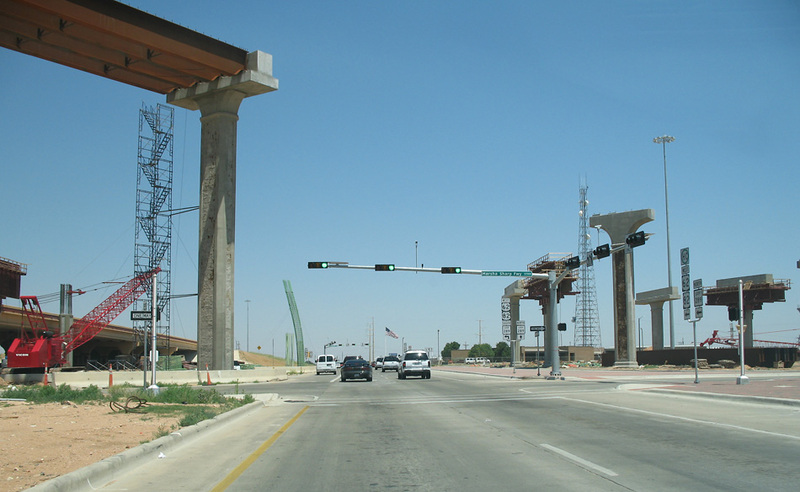 It looks like all contracts for frontage roads and freeway main lanes are awarded from just west of I-27 to west of Loop 289. 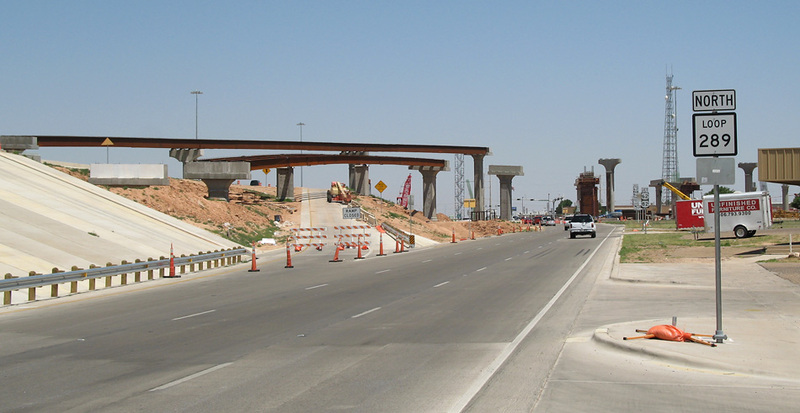 The last remaining contract to be awarded appears to be the interchange at I-27. 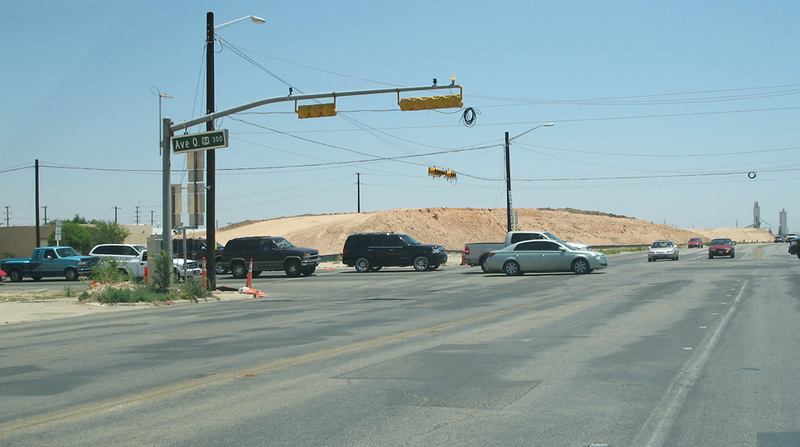 It is listed as a $55 million project in TxDOT's project listing. 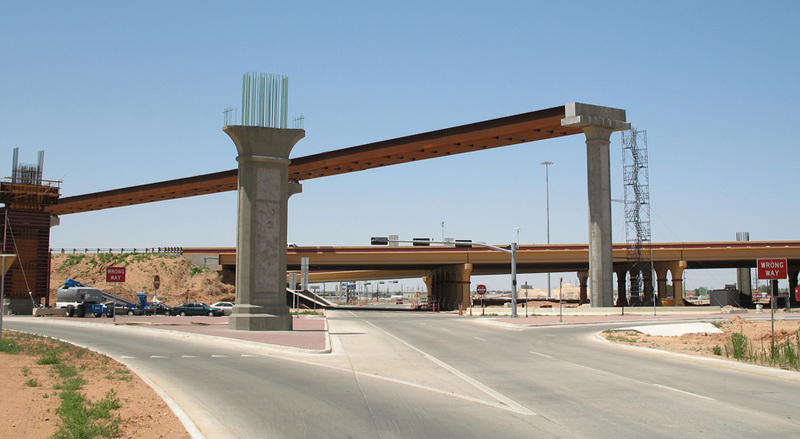 A substantial amount of right-of-way clearance was needed to build this freeway. 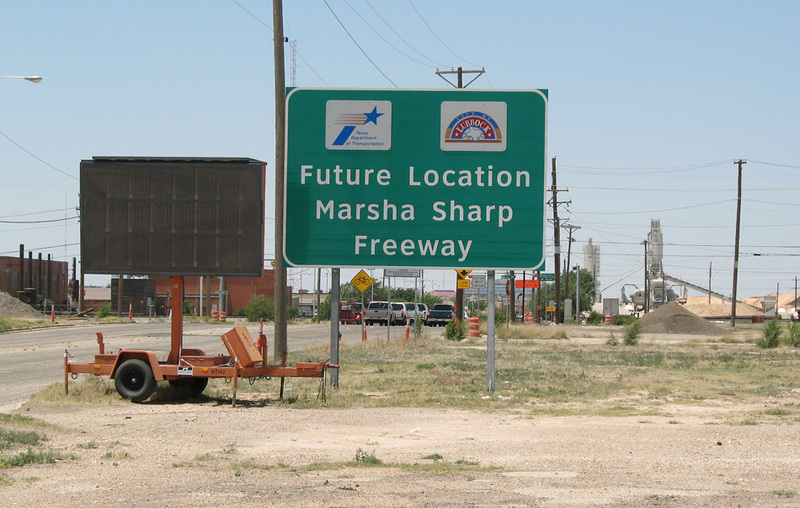 This freeway is named the Marsha Sharp freeway. She is the head coach of the Texas Tech women's basketball team. It seems strange to name a freeway after a women's basketball coach. You would think that an arena or athletic facility would be named in her honor. However, you usually need to donate millions of dollars to get a university building named after you, but no money is needed for the freeway naming. Photos start at I-27 and proceed westward. This sign is along US 82/82 just west of I-27. The future is going to arrive soon. 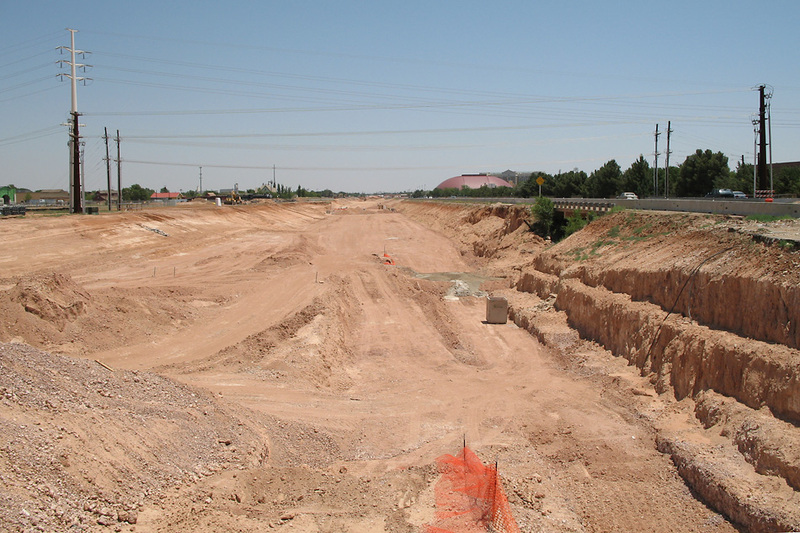 This is the existing US 82/62 going westbound just west of I-27. It is a four-lane urban street with a center turn lane. For its entire length in this corridor the existing highway is a four- or six-lane urban street with a center turn lane. This view looks east, showing Interstate 27 in the background with cleared right-of-way for the future interchange in the foreground. 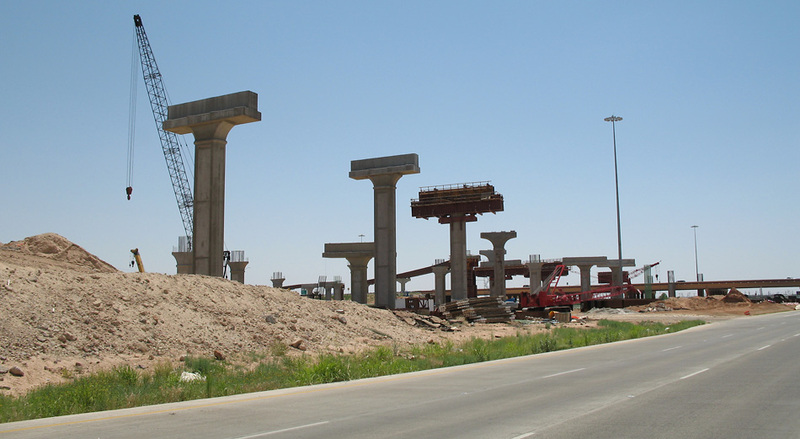 The TxDOT web site lists the interchange as a $55 million project. Just ahead is the concrete batch plant. 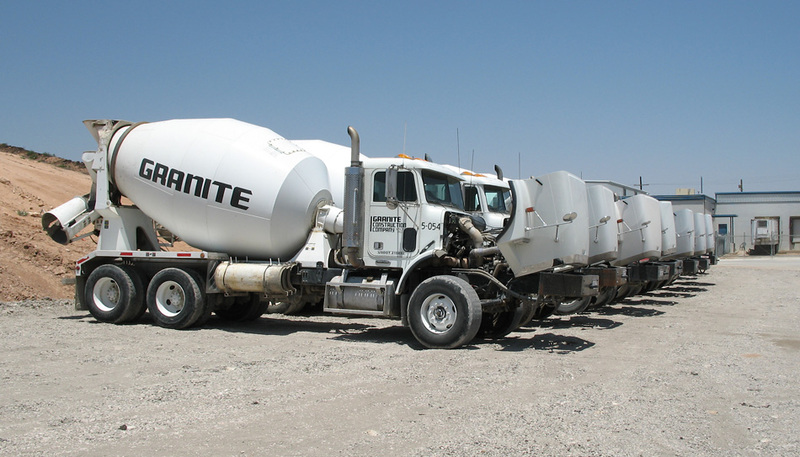 For some reason all the Granite concrete trucks had their hoods open on the Sunday of Memorial Day weekend. 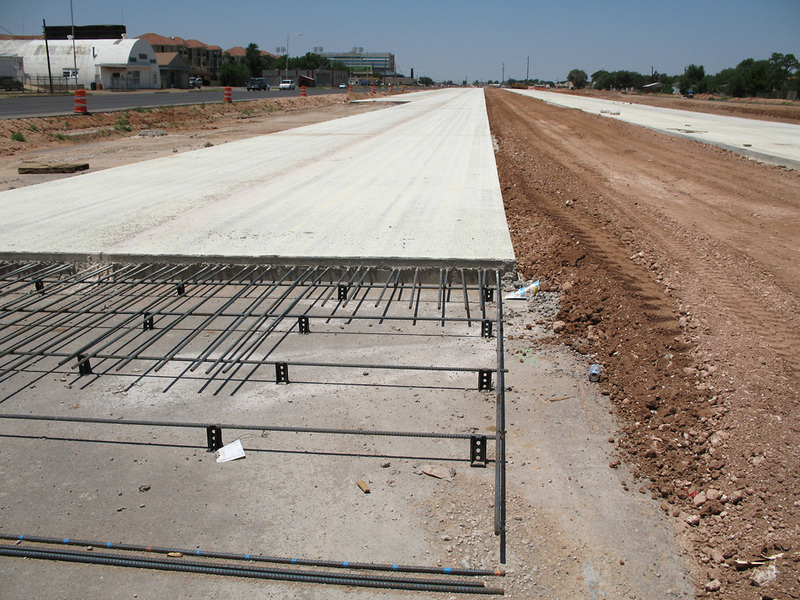 At Avenue L we see the westbound frontage road with embankment for the main lanes to the left. This view looks eastbound at Avenue Q, showing embankment for the overpass and the concrete batch plant in the background. This view is looking east from a location west of Avenue Q, with embankment for the Avenue Q overpass in the background. This shows the concrete of the future eastbound main lanes. The concrete looks like it is about 10 inches thick, definitely not as thick as the 15" thick pavement used in Houston. We are now approaching Texas Tech University. In the background is the football stadium. 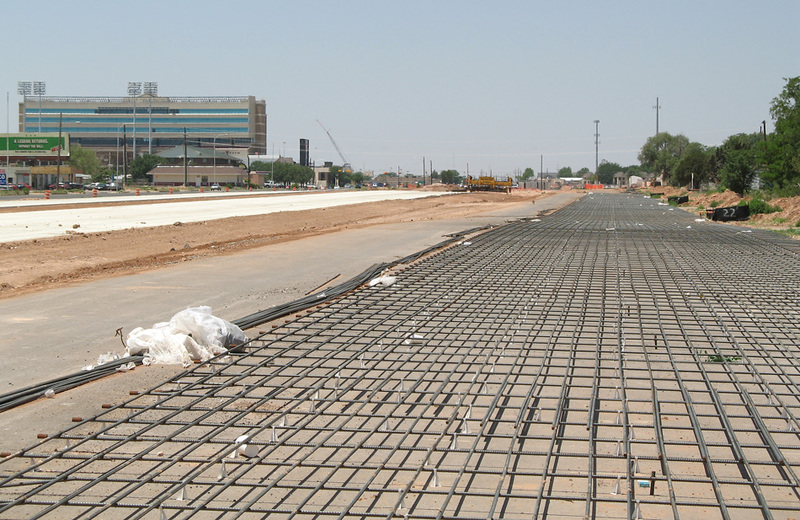 This view looks west with the rebar for the future westbound frontage road in the foreground. 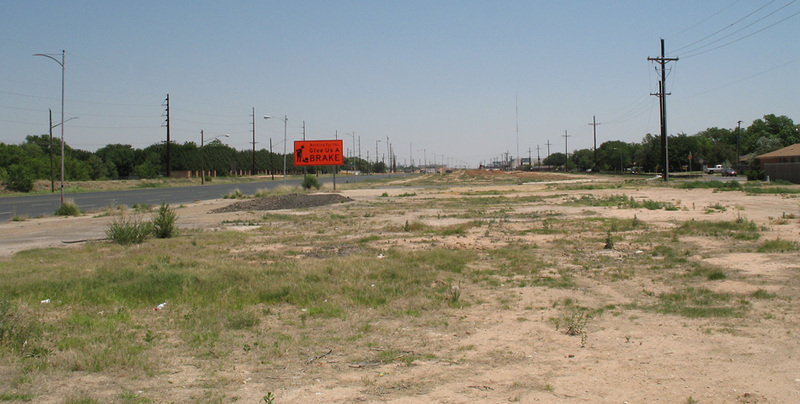 This view looks east from University, which is the eastern boundary of Texas Tech University. 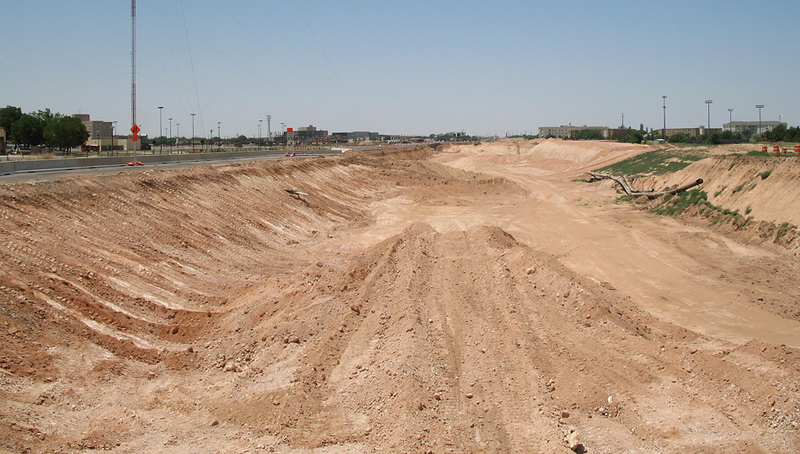 The freeway will be depressed in a trench as it passes through Texas Tech University. Here we can see excavation for the trenched freeway. 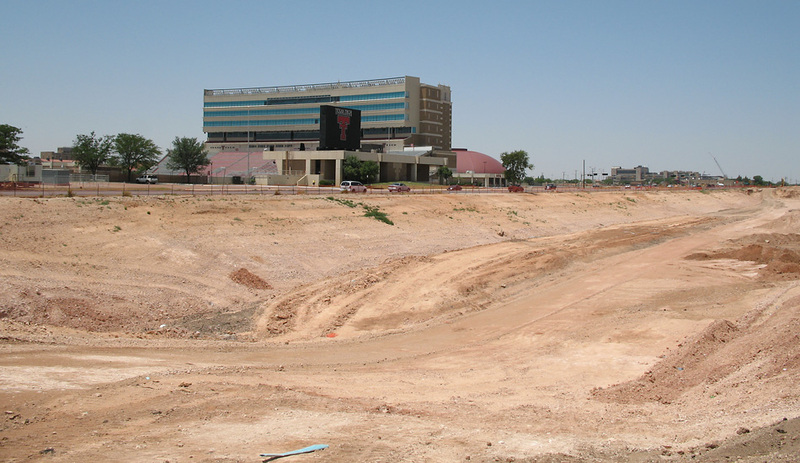 This view looks southwest at University Drive, with the Texas Tech Red Raider football stadium in the background. 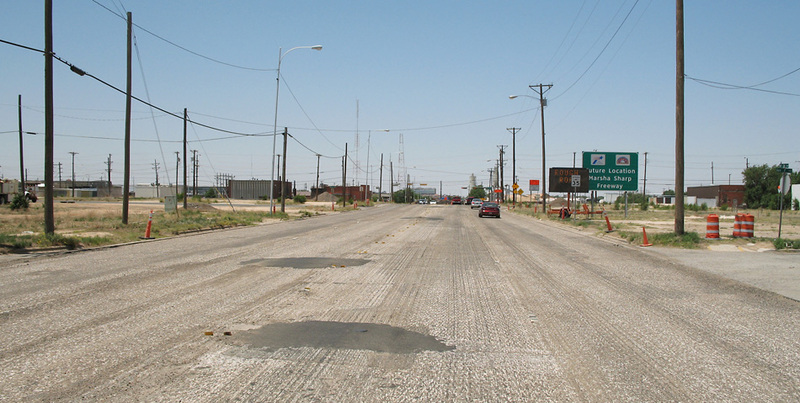 Indiana Avenue is approximately in the middle of the freeway section through Texas Tech University. Here we can see that a railroad once existed on this corridor. This view looks east. 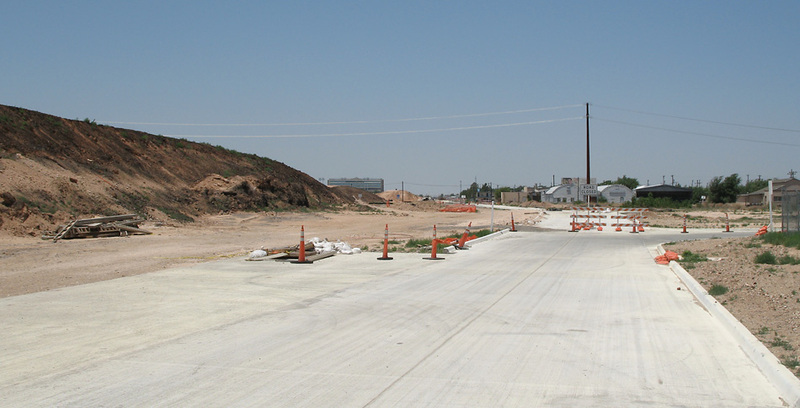 This eastbound-looking view from Indiana Avenue shows excavation. 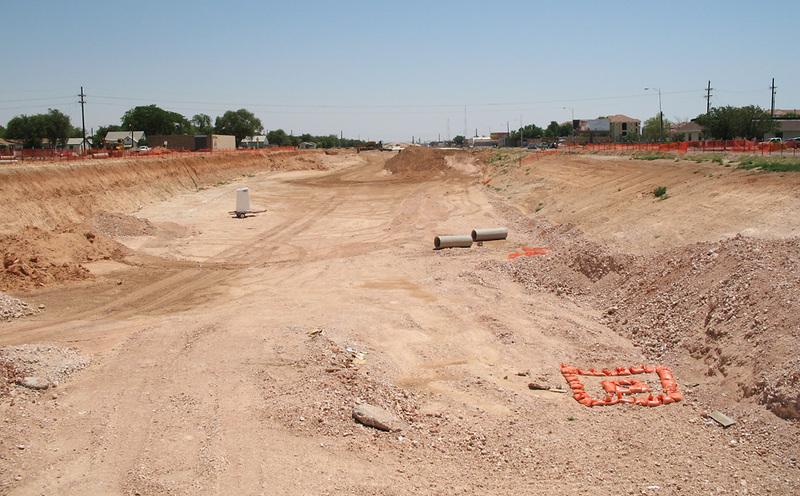 This view looks westbound (west-southwest on the compass) from Indiana Avenue showing excavation. 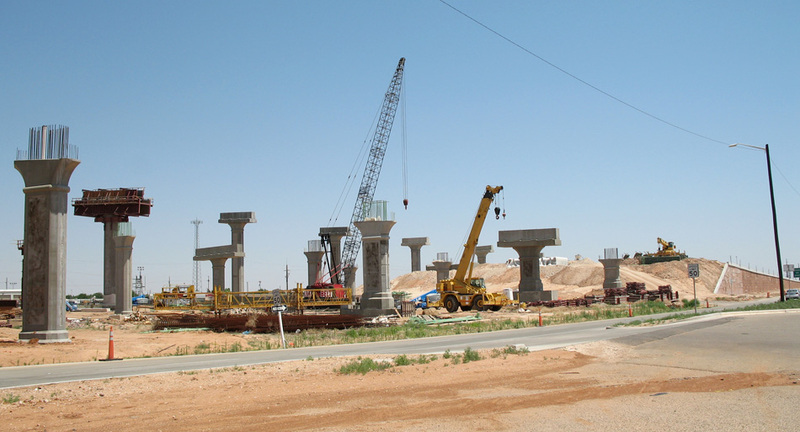 This view looks eastbound and shows excation with piers for the 18th Street overpass. We proceed west and leave the Texas Tech campus. The freeway returns to ground level. This is the overpass at Quaker Avenue. 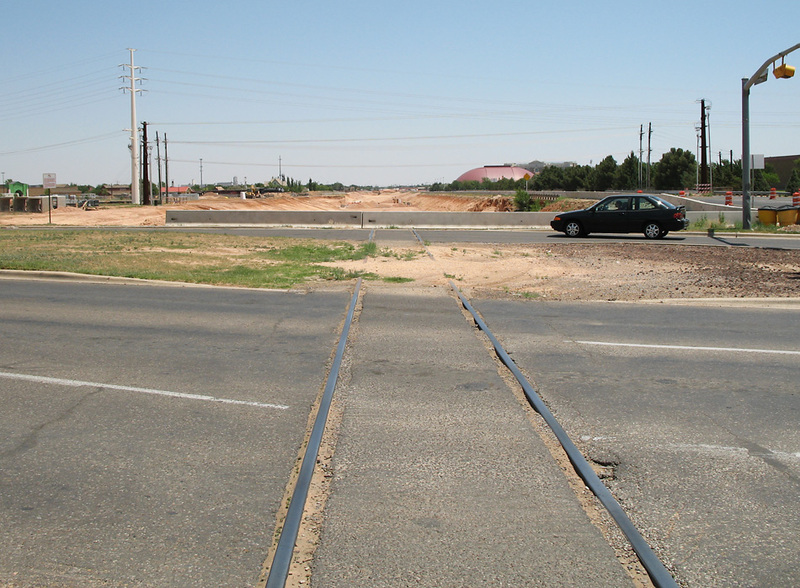 This view shows cleared right-of-way west of Quaker Avenue, looking eastbound. This is the same location as the above photo, driving westbound. This interchange with Loop 289 is just ahead. The interchange features two direct-connect ramps. This is the view of the interchange on the US 82/62 westbound frontage road. 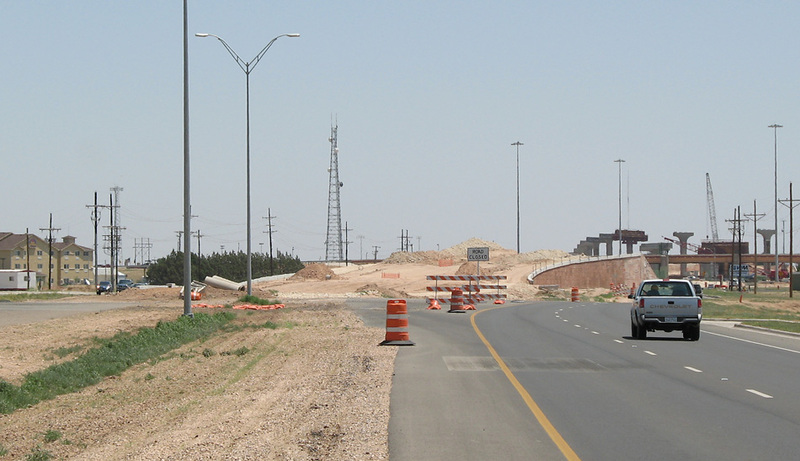 After passing through the interchange construction zone, this is west of Loop 289 where the US 82/62 main lanes return to ground level as viewed driving westbound on the frontage road. Now we have turned around and are going eastbound, west of Loop 289. This is where the construction project begins. Going eastbound, approaching the interchange construction zone. Going eastbound, approaching Loop 289. This view is on the northbound Loop 289 frontage road. This view looks west along the US 82/62 eastbound frontage road. This view looks northeast showing piers for the US 82/62 main lanes and the ramps. 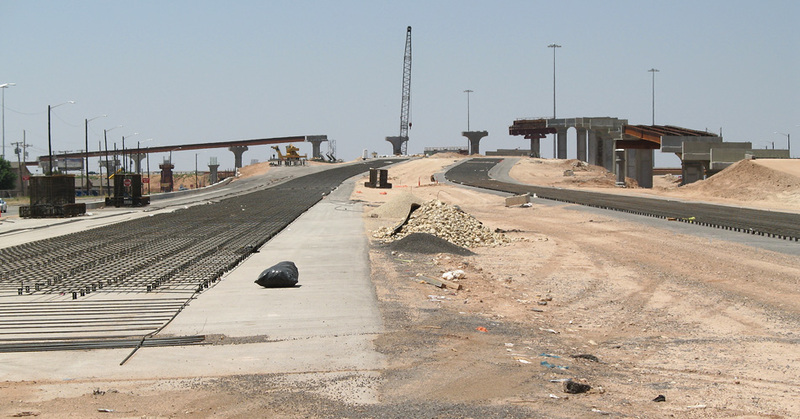 This view looks north from the southeast corner of the interchange. This view looks north along the Loop 289 northbound feeder.